I finished this bag a couple of weeks ago. 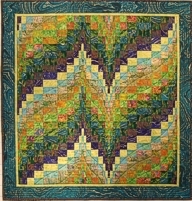 The traditional patchwork blocks on each side are made up of folded fabric patches, – a very easy and fun technique. 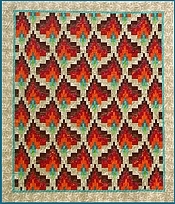 It is a project for a new class at Quilt Campus. I have almost finished writing the class material, but it will still be some time before it is online. In the mean time, it is possible to attend one or two of my other classes there. 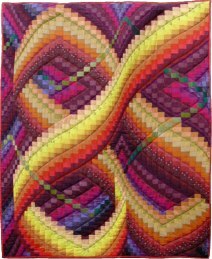 Just go to http://www.quiltcampus.net to see what is available, and when. 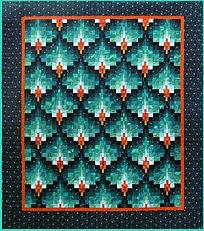 The first is similar to the Ohio Star patch, one of my favorites. Eldrid, I’ll bet you’re a fantastic teacher. Denne quilten er bare helt nydelig. Liker godt blåfargene dine. Skulle ønske det var jeg som hadde sydd den. Takk for det, tubakk 🙂 Du ville nok ikkje hatt problem med denne sidan du er vant til små lappar, ser eg.